In order to compare inter-and intra-ethnic variability in drug response, in Japanese and Caucasian subjects, the clinical data for five drugs has been reviewed, focusing on the pharmacokinetic parameters. These drugs represent different pharmacological/therapeutic classes. No pharmacogenetically linked differences between Caucasian and Japanese subjects were found. 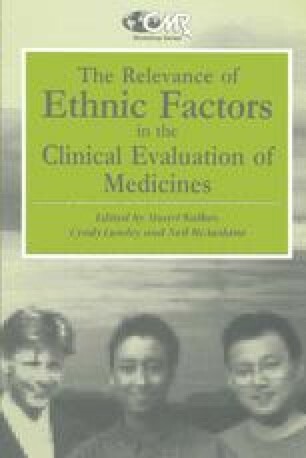 With regard to pharmacokinetic parameters, for all five drugs the intra-ethnic variability was higher than the inter-ethnic variability. Differences in methodology and the number of subjects studied might contribute to the apparent variations in pharmacokinetic parameters. In order to draw firm conclusions regarding inter-ethnic differences in drug response it will therefore be necessary to harmonise the principles and technical aspects of drug development methodology.